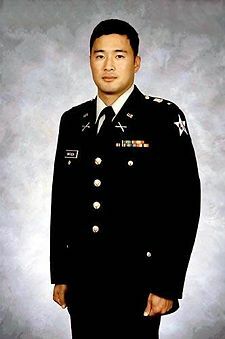 Many people I know, especially veterans (even antiwar vets), have mixed feelings about Lieutenant Ehren Watada, whose trial was blocked today by a federal judge. Some vets saw it as a betrayal of those under his command, others that the war was best resisted from within, For other, including myself, the ambivalence stems from the way his original decision — as the first Army officer to refuse to deploy to Iraq — was first taken up by (admittedly hard-working and sincere) front groups for front groups for the ossified sectarian left (whose militant rhetoric makes most of us giggle these days). All of which made it harder for many to simply look at what the 27-year-old college and OCS graduate was actually saying, about what he still considers an illegal order. Thank god for non-front groups like CCW and Vets for Peace, from whom I got the news today. 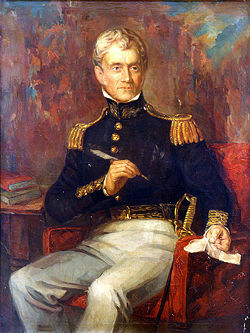 lust for power and greed for land veneered with the tawdriness of false humanity,” wrote one, by then a U.S. senator as well as a survivor of the Battles of Shiloh and Spotsylvania. His sentiment echoes Watada’s, but the quote that gave this post a title is from far earlier, because I think it’s more relevant to what Watada faces next. Settle barred the military from retrying Watada on charges of missing his redeployment to Iraq, taking part in a news conference and participating in a Veterans for Peace national convention. But the court did not rule out the possibility that the Army, after considering legal issues, could retry Watada on two counts of conduct unbecoming an officer resulting from his media interviews. Watada’s attorney sensibly told the press that he hopes to get those charges dropped. That could be done without explicit vindication of Watada’s position. But part of me wants to see that second trial, if only to prove Sylvanus Thayer wrong. Someone should write a book about soldiers and vets who hold on to that “erroneous” impression. Oh right, I forgot. Congratulations, Lt. Watada. When can I give you a call? This entry was posted in book, history, human rights, journalism, military, organizing, politics, veterans, writing and tagged Center on Conscience and War, conscientious objection, Courage to Resist, dissent and soldiers, I Ain't Marching Anymore, Lt. Watada, Sylvanus Thayer, Veterans for Peace, VVAW-AI, West Point mutiny on October 22, 2008 by chrislombardi. The first link goes to ThankYouLt.org. which you state hijacked Ehren’s case. Do you really want to state that Ehren’s own mother, Carolyn Ho who administers that website may be “hardworking and sincere” but she has “hijacked her own SON’S case? You might want to correct yourself on that now that you have this information. Carolyn was initially AGAINST Ehren’s decision to not deploy and take the military on, but be WILLING to pay the consequence of imprisonment should he be convicted. Her motherly protective instincts are to protect and SUPPORT her son, certainly not to “hijack” his case! Secondly, Judge Settle dismissed ALL the counts Ehren was actually court martialed for based on double jeopardy. The other two counts had been set aside without prejudice by the prosecution in the first trial because in order to save Sara Olson and Dahr Jamail from answering their subpoenas, Ehren stipulated to having made the statements he did to them. In return the prosecution did NOT try him on those charges the first time, so Judge Settle can’t rule double jeopardy when Ehren was NOT tried on those charges. Ehren’s attorney did submit papers to Settle to remove those charges also from the military’s intended second court martial based on a recent ruling, Wilcox. Judge Settle basically said it was a matter for the military to decide whether or not to pursue the issue and that Ehren would have to argue the recent Wilcox ruling THERE. One thing must be made clear though, Judge Head CLEARLY knew that Ehren had stipulated to FACT that he missed movement but had entered a plea of innocence because it was Judge Head who ACCEPTED the stipulation and Judge Head who tossed out all of Ehren’s witnesses as to the illegality of the war. While it is VERY interesting to read Settle’s opinion, some facts which go to Judge Head’s clear manipulation of the trial are omited. Robin – thanks for the clarification. I meant no disrespect for the groups working on Lt. Watada’s behalf, and I’m glad that Ms. Ho is coordinating the effort. (I just changed “hijacked” to something less freighted, since that wasn’t the point of the post). And thank you both for the legal clarifications — I’ll need it all when I finally write about this in depth. “Initially, Watada, an artillery officer, was ordered not to talk to anyone other than his civilian attorney, Eric Seitz, who is now traveling in Europe. Obtaining a copy of that order in which the Army rescinded their gag order would be most interesting. Here is the basic info on the journalist subpoenas. ” The only thing Watada said that I would disagree with is that he claimed that he is not a hero. He is a leader, yet again, by taking this stance. And he may never know how many lives he has already touched. Today, it is up to the anti-war movement to make sure his leadership touches as many soldiers’ lives in Iraq as possible. Watada is making his stand. He needs continued support. For this the Army subpoenaed him. Note: Ehren went to a commanding officer at Fort Lewis who told him that all statements he made would need to be done while not in uniform and off base per the USCMJ. Ehren followed this rule to a tee. HOPEFULLY the military if they retry Ehren on these charges will not toss the case in to Judge Head’s court room. Remember, he ruled on his own rulings and refused to recuse himself. If anyone calls this transparent justice they have rocks in their head. The military is simply dragging this out as long as they can. Note also, in the courtroom the day of the mistrial the prosecution was initially not in favor of a mistrial which was Judge Head’s idea. The prosecutor, young and new to the case actually stated, “He thinks he has a case (the illegality of the war) we don’t” Ehren’s belongings had been packed up in his apartment and he was prepared to face arrest should he be found guilty. NO ONE can take away Ehren’s willingness to face prison should he have been found guilty. Yes he fought, on firm legal grounds, the Nuremberg Principles which the US is bound to by treaty, a memo the military seems to have not gotten nor to have read when Ehren introduced it as his defense. Isn’t interesting how the human condition remains the same. Here you are delving into the past, while the same story continues to unfold in the present. I did not read all the comments but I confess I too was a little confused as to how the first website you list as such is a front group for a front group. It wasn’t obvious from looking at the site. so I’m wondering what hidden connections you know about? In any event, thanks for bringing this to my attention – as you know I’m not a news junkie so some important things pass me by.